Performers include: David Hasselhoff, Edward Mulhare, William Daniels, Richard Basehart, Patricia McPherson, Rebecca Holden and Peter Parros. Michael Knight (David Hasselhoff) is a former police officer who has been given a new face and identity by the Foundation for Law And Government (FLAG). 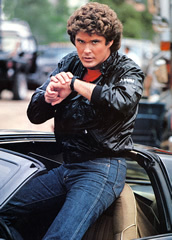 Acting like a chivalrous knight of medieval lore, Michael helps those in need with the assistance of KITT (Knight Industries Two Thousand), a super computer running inside a high-tech black Trans Am. KITT is so advanced that it has artificial intelligence and frequently banters with Michael (via the voice of actor William Daniels). Michael is given his assignments by FLAG’s Devon Miles (Edward Mulhare).